We've created an incredible ebook that will be your go-to guide for everything involving applying for physical therapy school. The application process for physical therapy school can be daunting, with everything you have to gather and fill out. But don’t panic! You are not alone, and hopefully, this guide helps you breathe and know you can do this! Complete your prerequisites. These are the classes that you have to take in order to apply to physical therapy graduate school. It is best to get above a C (some schools will accept at least one C) in all prerequisites. If you have a C- or lower most schools will not accept the grade for the class. Let’s say you do have a C or lower in a class or a few classes, the best thing to do is retake the classes. This will strengthen both your cumulative GPA and your prerequisite GPA. It will also show schools that you are striving to better your grades and strengthen your application. In some cases, schools are okay with you having one C in a class. Also, be careful with how many times you retake a class. Some schools only allow a class to be retaken once outside of the first attempt. I know that sometimes people question how many prerequisites they can have in progress/not yet begun before applying. Well, it usually depends on the physical therapy school, but most schools only allow one or two classes that are in progress/not yet begun. It is always a good idea to check the school's website or contact the school to find out. Medical Terminology * not all programs list this as a requirement, although it is helpful! Most schools do not mind if some of your coursework has been taken at a community college. I know many students worry that if they take a course at a community college it is frowned upon. More often than not schools will allow you to take classes at a community college. There may be some physical therapy schools that require all or some classes to be taken at a 4 year University – if you are worried it is always best to ask the school you are interested in. Check to see how physical therapy schools will incorporate any grades you received in a class you retook. Okay, so I know many of you may be wondering where to start. Good question! When it comes to observation hours it is good to have a variety so look in to clinics and specialties that interest you! Call these clinics or email them and let them know that you are interested in shadowing/observing a physical therapist. Once you are in contact with them it is often best to do 20-40+ hours at each location. Physical therapy school requirements range anywhere from 20-40 hours so definitely make sure you meet each schools number of required hours! I personally always did 30+ hours in each setting to ensure I reached each school's minimum requirements. A good number of total hours to have is 100 +. Why? Well it shows that you have experience in the field and a wide range of exposure. It also will help you reach every schools minimum number of total hours . Having observation hours from a variety of physical therapy settings is recommended. For this, it is always good to have inpatient and outpatient hours. For an inpatient setting, an acute care hospital, skilled nursing facility (SNF), or a rehabilitation hospital are all good ideas. For an outpatient setting, any clinic that is freestanding and not a part of the above is considered outpatient. Some fields you may want to look in to are: geriatrics, pediatrics, orthopedics, women’s health, prosthetics, veterans hospital, neurological physical therapy, therapy in a school, sports rehab, and cardiovascular and pulmonary therapy. There are a wide range of specialties in physical therapy. Make sure to let the places where you are shadowing know what kind of experience you are looking for. Be clear about this so that you get the most out of your experience! Things like that are some examples. Also let them know that you want to specifically shadow a physical therapist. Definitely connect with patients and get comfortable interacting with them. Do not be afraid to ask questions. All of these tips will help you create a relationship with physical therapists you observe, instead of just being another body in the room. Make sure to have a log where you track your hours and have the physical therapist sign off on the log just in case! Lastly, get reliable contact information from the physical therapist who you are shadowing and if possible have a backup physical therapist that can verify your hours at the same clinic. I suggest this because it will help you always have someone you can get into contact with, just in case things change or there is a problem. It’ll save you the headache! Most physical therapy schools require you to have at least one letter from a physical therapist and a professor in your major. It is important to check what types of letters of recommendation each school you are applying to requires. Even sending them a quick email early on asking them is a good idea so you know who is going to write your letters! It helps save you the headache of scrambling last minute if someone fails to write your letter. Who is most likely to support you? Who has seen your accomplishments? Who has watched you problem solve? Who sees your characteristics? Who has seen you demonstrate integrity and compassion? It is so important to develop strong relationships with your professors and the physical therapists that you observe/work with. You want them to see you shine, and have no question as to why you want to be a physical therapist! My biology professor for a class that I retook at a community college. I arrived to class early every day to ask questions. I also stayed after for open lab to make sure I understood the material and for clarification. I always had questions! I also helped my fellow classmates with anything they struggled with. Because of all these things I knew he was the right professor for me to ask. He was able to see my characteristics and wrote me an extremely strong letter. I then asked the two physical therapists I work with now- I had been hired as a rehab aide for about three months and developed a good relationship with both. I helped my coworkers with anything I saw they needed. I was prompt and early to work. I interacted with all the patients I worked with. I asked tons of questions to learn. I always remained positive and tried to put patients I worked with at ease. The physical therapists at my job saw this and were able to write strong letters of recommendation for me! The last person I asked to write me a letter was a mentor I had for about four years. She was the Director of the Latino Resource Center on campus. She saw my growth as a student; the good and struggles I had. She also pushed me to become a better student and to never give up on pursuing my dreams. She was there every step of the way throughout my college career. This individual was also able to write a strong letter of recommendation. These are just some examples from my own experience. I know that some students worry about only knowing a therapist or professor for a short amount of time, but if you really show who you are then there is no doubt that you can make a lasting impression! I only knew my Biology professor for the 5 weeks of the summer class, and I only knew the physical therapists I asked for 3 months so it can be done! Be you and you’ll flourish! I am definitely not the best at standardized test taking. But I did my research on what the best ways to study were and what materials to use. I will share with you what worked for me. Study for two months at a minimum, for at least two hours a day. Take multiple practice tests to get better at taking the test. Study in a quiet environment that does not have any distractions for you. I couldn’t study at home so I would go to the library, park, or café. o Manhattan Prep GRE series for the quantitative portion and the analytical writing portion. o Magoosh.com for the text completion and reading comprehension. The test can be really intimidating, but don’t stress! You will do well if you have the right materials for your study habits and are diligent. Try to score a combined score of 300+ and a 4.0+ on the analytical writing portion. Let’s say you score below this try to retake it to score a little higher. You can also apply to schools that do not weigh the GRE heavily. BUT always put your best foot forward and do the best you can on the test. Some schools weigh the test heavily, or will use it as a positive if your GPAs are low. Make a list of all your extracurricular activities and volunteer experience. It literally can be anything you have done! All of these things give schools insight into who you are. Many schools like to see volunteer experience because their program gives back to the community. It also shows that you are committed to giving back to others so it’s a great thing! I know many people worry that their extracurriculars are not pre-pt club or things like that – that is okay. Or many people may not have much extracurricular or volunteer experience at all do to work – this is also okay. Schools just like to see that you were active in some way throughout college. I was active in organizations that did not align with physical therapy: a women’s group on campus and an honors society and a few more. I also participated in various leadership conferences on campus. These are just some of the skills you can gain! I personally loved the experiences that I had with research. I gained wonderful mentors in the field of physical therapy who have offered me professional and academic advice for years now. I also learned about what my passion is. It opened so many doors for me, and taught me many things. Pediatrics and how parents can be incorporated in to their therapy. If you are wondering how to get involved with research, go ahead and comment below or contact us. All of these things were in my application. I learned from each and every opportunity. So make sure to include your experiences! For the essay portion of your application, there are 3 types of essays you may come across: personal statement, supplemental essays, and a re-applicant essay. For the personal statement, you want to focus on you. Often times students get carried away with what they learned from others, rather than writing about how the experience shaped them into the type of physical therapist they want to be. Or students may write about how they became interested in physical therapy through an injury. This may be how you became interested in physical therapy, but what else furthered your passion for it? What else helped you learn about physical therapy? Be sure to include these experiences. Admissions committees tend to see a lot of the same kind of essays – so make yours unique. Let them see who you are in the essay! This is so important because programs want to get to know the students who are applying. This is especially important if the program does not conduct interviews, because your essay will be what gives them a sense of who you are. Also, make sure to answer the question as well, and do some background research on the question if there is a quote or statement. This will help you organize your thoughts and have a better understanding of what the question is asking. Supplemental essays are other essay prompts that a specific physical therapy program will want you to write about. This may give the program more insight to who you are, so these essays are also important. Many of the tips listed above for the personal statement will apply here too. Make sure to put time and effort in to these as well. The re-applicant essay is only for students who are reapplying to a program that they applied to the previous year. This essay will give the program insight on what you have done to improve your application since last applying. Make sure to let them know the exact things you’ve done! This is your time to show them that you took their advice into account and made improvements! *Make sure to have more than one person read your essay. Mentors, professors, friends, and the writing center at school are great sources to review your essays! This will be one of the most important pieces of advice that I can give you.Many students make this mistake and I want to help you not do the same! I myself did this and learned from it. Make sure to apply to schools whose minimum requirements you meet. This will save you time, money, a headache, and a rejection letter from that school. How can you do this? Look at your GPAs to make sure your prerequisite GPA and cumulative GPA meet the minimum for the particular program you are interested in. Most schools require a 300 combined score or above on the GRE. So make sure that you meet the score requirement for that school. Make sure to have the required observation hours in each setting that the school requires. 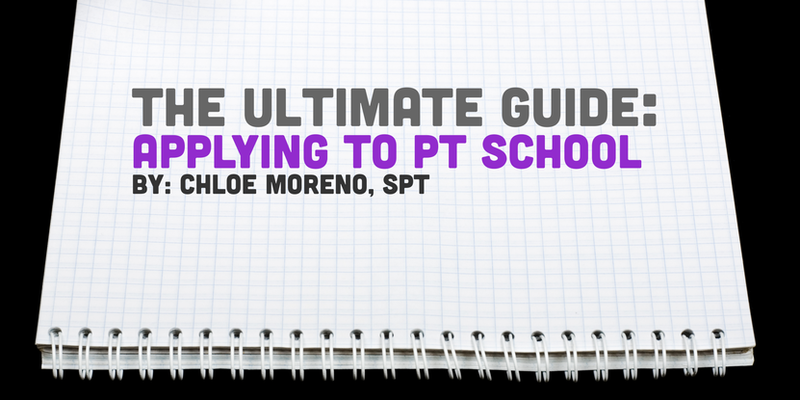 Make sure to have recommendation letters from each person that a PT school specifies. Make sure to have the required classes that the school has listed as prerequisites. How can you be strategic, especially if you have a low GPA or GRE score? They list PT schools by state or alphabetically. There is also a list of schools who do not use the PTCAS application system. Look into [ER3] schools that have a lower required GPA that is around yours. Look into PT schools that will allow you to replace a low grade with a retake grade if you retook a class (this will make your GPA higher). Look into PT schools that use your last 60 credit hours as one of their GPAs they look at. This works for students because sometimes this GPA tends to be higher. Look into PT schools that do not require the GRE. Look into PT schools that do not have a minimum score requirement for the GRE. Earn more observation hours in different settings. Gain super strong letters of recommendation. Write a strong personal statement. Contact the PT schools you are interested and find out what your stats/application looks like compared to students accepted in the past. This will give you an idea of what the school looks for if you are unsure of whether or not you should apply. Attend graduate school fairs at your school. This will allow you to talk to different representatives from various schools. What should I look for when applying to a school? Many times students will use a ranking list for PT schools. These ranking lists should not be all you use to determine which school to apply to. Often times the ranking lists are surveys that are conducted –which does not provide actual information about the physical therapy school ranking. So it is important to do your own research. See if the PT schools you are looking into have scholarships. Check to see what the faculty is like and if they have interests that align with yours. Is the location somewhere you can see yourself? What are their graduation rates? What are their passing rates on the NPTE? How long are their clinicals? How supportive of an environment is it? What other opportunities does the school offer (electives, study abroad etc.)? First and foremost, make sure to apply as early as possible! This means you should try to get your application in as early as July –August. This is the best time because it puts you in front of the admissions committees early on. Especially if a school offers rolling admission. If your stats are not too competitive this is a good time to apply as well. Sometimes applying this early may not be possible or you have a later deadline for a school. My advice is to contact the school and find out if it is too late to apply. This will help save you money because sometimes schools fill up their classes and your application will not be looked at – this doesn’t always happen so like I said it is always best to contact the school! IF a school has a later FIRM deadline (aka, not a rolling admission: the school will not look at applications until after this deadline) then you may be able to get away with applying at a later date. But still early is best! Make sure to save money before applying. I say this because the application process can be extremely expensive when all is said and done. Since you have to pay for transcripts, the GRE, GRE scores to be sent, and every school you apply to it is best to have some money saved up! Not every school offers scholarships –but check and see which ones do! This is very helpful when it comes to high tuition prices. I would also ask if school offer TA or work-study positions for students because this will give you some spending money and sometimes a tuition waiver! Make connections with the schools you are applying to! Email admissions representatives if you have questions; this will make your name stick out, as well as show your interest in the program. DO NOT BE AFRAID TO ASK QUESTIONS! Have a mentor. Mentors are great and can offer you good advice. They are a great source especially when it comes to reading over your essays, networking, and helping you navigate your academic career. Tour schools if you can! This helps admission representatives put a face to a name. It allows you to get a feel for the school, ask your questions in person, and figure out if it is somewhere you would like to attend. It is also a great time to interact with current students from that program! I really hope all of this has helped you and made you feel more confident about applying to physical therapy school. These are all things that I have learned over the past few years from applying and finally getting into physical therapy school! I know the road can be tough and overwhelming –but the finish line is so worth it! So hang in there, and make your application shine!